Wow! Just look at those endorsements near the center of the page! 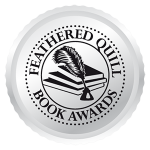 The likes of Midwest Book Review, Feathered Quill Book Reviews & Awards, and Readers' Favorite Book Reviews & Awards (times 3), offer glowing praise for this compelling novel. Life is good for Dr. Drew Coleman, a successful young eye surgeon living in Uptown New Orleans, and he knows it. Having met and married his beautiful medical school classmate, Kate, the two settle happily into the routine of raising their two young daughters. Drew's charmed life is soon shattered by devastating news, causing him to go on a ten-year transcontinental journey of self-discovery, during which he explores the nature of God and Man, the divine inspiration for many of New York's landmarks and artistic treasures, and the relationship between the found and the lost souls passing on the street. He meets a number of memorable characters, including the young blue-haired runaway, Blue, who renounced her given name when forced to leave her Minnesota home with her girlfriend, Anna. In time, he discovers and explains the scientific basis for the meaning of life, and is finally found, or finds himself, setting the stage for a bittersweet and memorable ending. COMING SOON: Watch for the unabridged audiobook to release in the not-too-distant future. To order a $13.95 paperback (we’ll add $5 for shipping & handling) AUTOGRAPHED BY THE AUTHOR, please click on the Buy Now button, and use PayPal or a major credit card. "Quill says: If you are looking for a great read with a little something extra, search no further; Love, Loss, and Lagniappe is the novel for you. 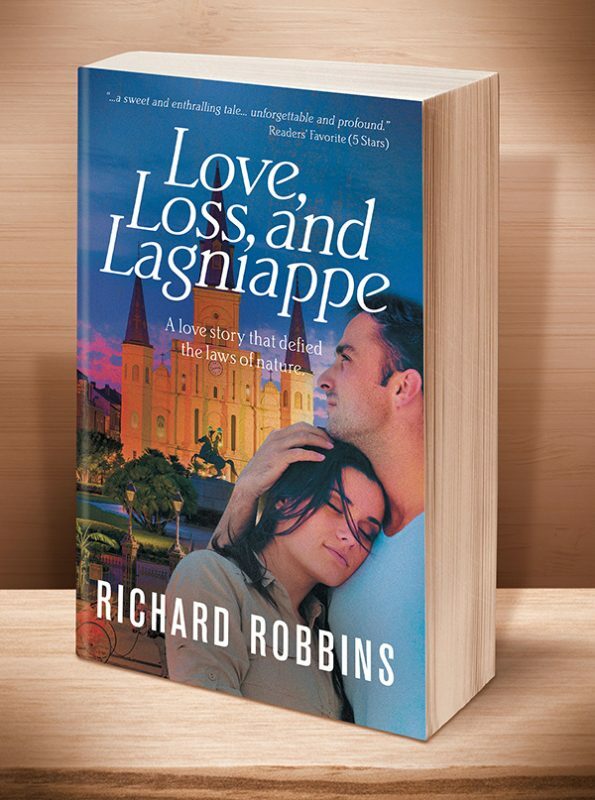 "Richard Robbins’ debut novel, Love, Loss, and Lagniappe, is not merely a simple romance novel, as the title states, of love and loss. It is a far more complex tale that goes beyond entertainment and encourages readers to think and consider a few concepts in life and relationships such as love at first sight, and sacrifice for the good of loved ones. Detailed descriptions of the cities in which Drew lived in or traveled through paint a vivid picture throughout the novel. Those descriptions, coupled with a memorable cast of characters, will hook readers from the sweet beginning, carefully guide them through the tragic and shocking middle, and will gently take them to the bittersweet ending. Love, Loss, and Lagniappe will leave readers (especially book groups) thinking about the events in this fast-paced story and how it unfolds, and asking themselves, 'What would I do in this situation?' long after completion of this book." "Love, Loss, and Lagniappe is all the more impressive when considering that [it's] author Richard Robbins' debut as a novelist. Written with a genuine flair for originality, Robbins has created a cast of distinctive characters deftly embedded in a narrative-driven, exceptionally engaging story that holds the readers' fully engaged attention from beginning to end. ...very highly recommended, especially for community library Contemporary General Fiction..."
"This is a fast-paced novel, with great moments of joy and devastating moments of heartbreak and sadness. Drew is the main character, and how he deals with life-changing moments are the foundation of this captivating novel. His choices are authentic and powerful yet could easily be misunderstood. There are layers of meaning, and an astute reader will dig in and truly relish the nuances within this plot. There is nothing like a long walk to clear the mind and discover life’s meanings. Author Richard Robbins has skillfully crafted a thoughtful romantic fictional work in Love, Loss and Lagniappe: A Love Story That Defied the Laws of Nature. This is much more than a romantic story!" "Richard Robbins’s literary fiction novel, Love, Loss, and Lagniappe: A Love Story That Defied the Laws of Nature, is a sweet and enthralling tale about two lovers whose chance meeting resonates with each of them for years. Robbins is the consummate guide to Tulane University and New Orleans, and I loved getting to know that city through his story. While I’ve read travel guides about New Orleans, somehow following Drew as he showed 'his city' to Kate helped me get a bit closer to the magic and mystery of that historic place. The plot is engaging and unpredictable in the best of ways, and the character study of Drew is unforgettable and profound, especially his time spent on the road and on the Appalachian Mountain Trail. Love, Loss, and Lagniappe: A Love Story That Defied the Laws of Nature is most highly recommended." "The word 'lagniappe' is unfamiliar, so I’m thankful for the clipped Mark Twain quote that Robbins uses in his introduction to explain it. In his prologue, the author draws our attention to Oxytocin and shows us proficiently what it is responsible for. I was surprised at the turn the novel took. Though this five-part novel starts out as one, this is not a romance story. Robbins puts a scintillating spotlight on those difficult decisions we have to make sometimes so that the people we love can remain happy. Even so, one reads this book hoping that Drew does not remain on his path. Providing a scientific answer as to what the meaning of life is at the end, Richard Robbins certainly inspires his readers to do what they believe to be the right thing." This entry was posted	on Thursday, August 2nd, 2018 at 6:15 am	and is filed under . You can follow any responses to this entry through the RSS 2.0 feed. Both comments and pings are currently closed.